Improper Preparation: Surface preparation can greatly affect the outcome of your fresh coat of paint. Preparation for your project should take about 70% of the time. This should address the possible potential problems of wood rot, mildew, severe peeling, siding problems, cracked window panes, crumbling glaze, loose caulking and trim issues, as well as if there is lead paint to remove. This also includes proper masking. Poorly masked windows and trim can result in hours of removing paint splatter and detailed repainting, as well as make your poorly masked lines, large clumps, and mismatched designs or colors a true eye sore. Tools and Materials: Each home will require different tools and materials. However, often homeowners do not already own lifts, ladders, scaffolding, as well as preparation materials, paint removers, caulking, paint applicators such as sprayers and quality brushes, or primers. Calculating what you need and the associated costs may turn out to be greater than simply hiring a professional. Failing to use proper equipment can lead to paint applied poorly, paint drips, or possibly unfinished areas making your new paint job visually challenging. Experience and Skills: When people look at something done well and are concerned about budget, they often think, “I can do that.” However, experience and skill are often disregarded. Techniques and tricks are developed by experts through problem-solving learned through experience, such as with over-brushing, using sprayers, proficient prep work, and putting on a thick enough coat. If you have never or rarely applied house paint or stain before, consider what it is worth to you to possibly stare at visual mistakes on your walls and if that in itself is worth the possible discount in price. Physical Requirements: Painting is physical work and requires a lot of upper body strength, as well as balance and technique for climbing ladders and painting with brushes overhead. A do-it-yourself job may seem easy, but if a homeowner isn’t physically fit enough to finish the job, then the job may not get done properly nor even get completed (not to mention the unforeseen accrued costs of chiropractic bills to treat a sore neck!). 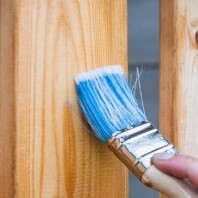 Painting your home can improve your house’s feel, especially with an expertly-applied beautiful coat of paint or stain. While Do-It-Yourself painting may feel like it will save you money, mishaps caused by lack of experience, skill, required tools, or physical fitness by a homeowner can thwart your painting goals. Often, the costs accrued by doing it yourself may exceed the estimate and efforts of hiring a professional. If you are considering a new coat of paint or stain, avoid the downside of a staring at visual eye-sore day after day and contact us for an estimate to see how our skills and experience may help you.